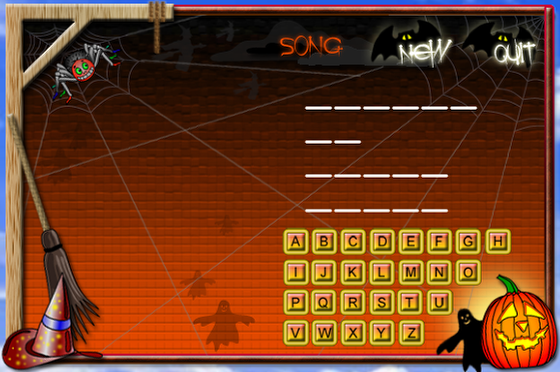 Hangman is a fun and simple game that everyone knows how to play. This tutorial will show how easy it is to create a Hangman game in LiveCode. And at the end you have a great looking game that is fun to play and can be extended in any number of ways. Once we have decided that we are going to create a Hangman game the first step in building our application is planning and design. We need to decide how we want our game to look, and think about exactly what it needs to do. The stack attached to this lesson contains annotated code to guide you through creating it. That's a good start, so now we will draw a few sketches of how our game might look. We have also decided to go for a Halloween theme so we will include this in our sketch. So a design might look something like the picture above. We can use this later as a guide when we create our user interface (GUI). What are the basic requirement of the game? These are the main things that our application needs to do. If we are sure we have thought of everything we can move on to the next stage and start creating the application. First we will create the user interface and then we will start writing our code. Since we already have a design this is relatively simple. LiveCode allows you to drag controls from the Tools Palette straight on to your stack and position them however you want. * 26 buttons each representing a letter of the alphabet again grouped together. We ensure that we name all our controls sensibly. The buttons and lines in the answer group are named for their position in the group eg button "letter11" is the button in the first column of the first line. It is always good practice to name controls well but in this case it is particularly important as we need to use the names of the controls to set up our games. Now that we have our GUI in place we can start writing code to make our game playable. Earlier we decided what the game needed to do. Now we will plan this further to make the game as easy to code as possible. There are things to consider, such as are there any actions that we might want to do in more than one place? If there are it is best to write a handler to do these actions which we can then call whenever it is needed without rewriting code. We also want to consider how best to write the code to make it simple and readable. hide all graphics in group "skeleton"
I have stored a list of answers as a custom property of the stack. The application can pick a random line from this custom property to be the answer. How do we check letters? When setting up an answer I set a custom property on each button in group "answer" to store what letter is in that position in the answer. When the user chooses an answer these custom properties are checked. 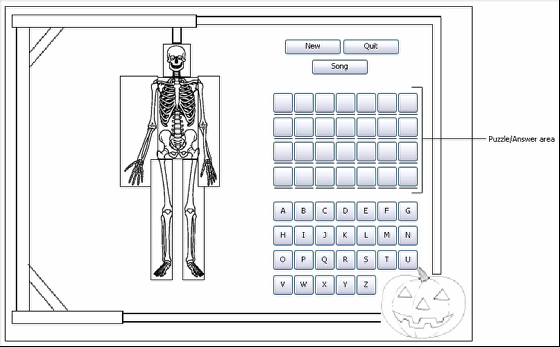 If the chosen letter appears in the answer those buttons are shown, if not the next part of the skeleton is shown. How do we keep track of the game state? We use script local variables on the card script to store how many correct and incorrect letters the user has chosen. 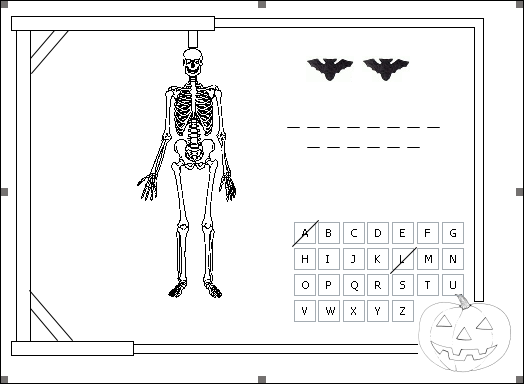 These variables are available to all the handlers on the card script so we can check if all the letters in the answer have been found or if all the parts of the skeleton have been shown. Can we avoid duplicating code on our Letter buttons in the Alphabet Group? Yes. As all these buttons do the same thing there is no need to repeat code on each button. We can put the code into the script of group "Alphabet" and use the target function to identify which letter was clicked. We also need to ensure all our answers will fit within the answer area so none of the ones I have used have more than 4 words and no words have more than 7 letters. To set up a game we first choose an answer, then we display the relevant image for the hint. Then we use repeat loops to step through each word in the answer and each character of that word. Due to the naming of the buttons and underlines in group "answer" we can set the custom property, icon and visibility of the necessary controls. Each word in the answer is represented by a line in the group. set the icon of button tButtonName to the id of image tImageName of card "Image Store"
Once you have written all your code and tested your game and are happy with it you can add more images to make it look even better. We have used images for the letter buttons and to display the answer, for the hints and for the New Game and Quit buttons. To use images on buttons we store the images out of sight on a second card. Here we import all the images we want using the Import as Controls option in the file menu. We then set the icon of the button to the ID of the image we want to appear on it. In LiveCode buttons can have normal icons, disabled icons, hover icons (shown when the mouse is over the button), Hilite icons (show when the mouse is down on the button) and others but these are the icons we will use. To ensure our icons display correctly we turn off a number of properties of the buttons including Show Name, Opaque, Three D, Border and Hilite Border. The background image can be imported directly onto the card as an image. Don't forget to set it to be the bottom layer so all your other controls appear on top of it. And there you have it. A fun and great looking game. This game could be extended in a number of ways, more answers could be added under more categories. The game could be modified into a 2 player game or a game that allows you to choose the number of player. With LiveCode the properties are endless.